A service member is supposed to be the example of fitness. Unfortunately, maintaining peak physical and nutritional well-being isn’t always easy, especially when you’re on a budget. It is convenient to gravitate to the greasy fast food and other unhealthy alternatives, but it all adds up, both in the wallet and the waistline. Remember these simple tips, and you will be eating healthier and saving money at the same time. Produce is cheaper when in season. Don’t get in the habit of buying the same fruits and vegetables regardless of what time of year it is. Learn what is local to the area, and don’t be afraid to try something new. Buy fruits before they are ripe, to give yourself the most amount of time to enjoy them. This way, you won’t be throwing money away. Believe it or not, many service members don’t use the resources provided for them. Choose to shop at your commissary rather than using a local supermarket. The prices are better, and you can save time and money by staying on base rather than traveling to the grocery store. If at all possible, buy in bulk. Doing this will cut down on costs and also save you trips to the grocery store. Make sure to check how much storage space you have, so any extra food doesn’t go to waste. This is especially crucial for the freezer, since family packs of different meats are great money savers, but need to be kept frozen until ready to be cooked. Never buy the pre-made meals at a supermarket. They tend to be priced higher than the individual ingredients, and are typically full of other, unhealthy additives. Make it yourself! 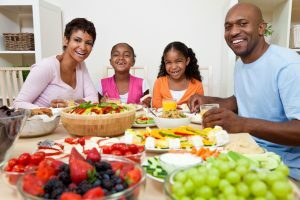 Home cooking is inexpensive, and can be a fun activity for you and your family. Buy what ingredients are on sale, and have a good time learning new recipes. You can prepare in advance and refrigerate, if time constraints are a concern. A little change here or there can make a world of difference. Drink water instead of soda, for example. This can be more affordable and cut calories out of your diet. Snack on fruits or vegetables rather than a junk food alternative. Use brown rice instead of white rice, since it is a healthier option. Eating healthy and cheap may seem like a challenge, but being prepared is important. If any problems do arise financially, Omni Financial has the expertise to help.